I’m very happy to be welcoming back Maggy from Red Ted Art today with a guest post all about the Science of Music. I love Maggy’s blog as she makes everything so pretty, whereas I only ever manage functional. Maggy has made “shooters“and explained roundabouts in previous posts, but today it’s all about making music! You could investigate how banging a drum harder makes a louder noise, or for older children try making the drum from different materials to see how that changes the sound. 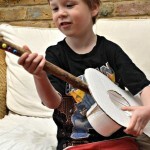 With the guitar, you could try different length and width elastic bands and see how the sound is different with each. Or, how about using boxes of different sizes to investigate how that changes the acoustics? It has been a little while since I last visited the lovely Science Sparks!! I adore this website as it make science so easy and fun and accessible. So many people think that they can’t do science with their kids as it is too hard. But Science Sparks shows us otherwise. It is all about observing your environment and asking lots of questions (even if we don’t know the answers). Normally you will find me over at Red Ted Art, getting crafty with the kids or Life at the Zoo, where I do a bit of everything (including a little science). So today, I will share some crafty projects, that have science element: MUSICAL CRAFTS! Yay. (Afterall, accoustics is science, right?!). First up, we have some simple DRUMS. We made these years and years ago, when my son was just 2 years old. He LOVED Them… and later his little sister enjoyed playing with them too. 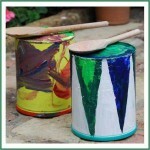 A great craft/ music/ science activity for preschoolers. We love these maracas, as they are made from REAL eggs, yep REAL eggs, if you papier mache them, they become strong and won’t break (you could talk about the science behind THAT for starters), but you could also fill them with different things and explore the different sounds. We made maracas AND shakers (basically, the same but without the “sticks”). We have lots more ideas that we wan to give a go SOON – making sound using water glasses or bottles, different “click clack” toys or jingly bells. Watch our little video to see and HEAR more ideas…. if you are after the web-links to show how to make the crafts in the video check out our Music Craft Post. 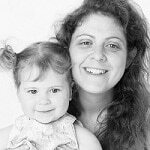 About the Author: Maggy Woodley, is a mum of two and loves all things crafts! She loves nothing better than to recycle and forage for craft materials –making crafts economical, a bit more environmentally friendly and fun. Maggy also writes at Life at The Zoo about cooking with kids, sciency “stuff” and the odd bit of gardening, as well as at Theatre Books and Movies for well, theatre, book and movies! Red Ted Art, is also now being translated into German, Spanish and Russian for more people to enjoy! Do check them out!